We love that Green Street Academy is a client of of What Works Studio. We are proud to have led numerous student enrollment campaigns for them and are excited that our collaboration resulted in Baltimore City students in seizing an opportunity to be a part of this innovative and inspirational school. If you stand on the roof of Gwynn Falls Park Junior High, you can see all the way out to the Key Bridge. Baltimore’s entire patchwork is visible from that height. The city’s most impressive (and expensive) buildings are much closer to streets of fading, boarded-up rowhomes than a ground-level perspective would suggest. Green Street Academy, a non-profit charter school with a sustainability-focused curriculum, is scheduled to move into this building next fall. Renovations are well underway, and I’m sure everyone involved has seen that rooftop view dozens of times. Part of me hopes they’re still impressed by it. As far as visual metaphors for the potential and risk of Green Street’s mission are concerned, that one’s hard to beat. I wasn’t sure what to make of that comment at first, but as I saw more of the building, I understood what Jon meant. Structurally, Gwynn Falls is in great condition, and many of its interior parts, including a “ridiculously efficient” heating and cooling system, either still function properly or don’t need much tinkering (relative to a project of this scale). Jon showed me planned areas for classrooms, computer labs, libraries, internal courtyards that are slated to become greenhouses, and a large space where the school’s tilapia tanks will be outfitted with a filtration system to create a closed-loop living machine, all without significantly altering the building’s existing infrastructure. The surrounding acreage will house the school’s chicken coop and other green-focused projects that their current location, which they share with another school, can’t support due to space limitations. Green Street Academy executive director Dr. Daniel Schochor was also present for my tour, and explained that the new Gwynn Falls location offered other advantages. 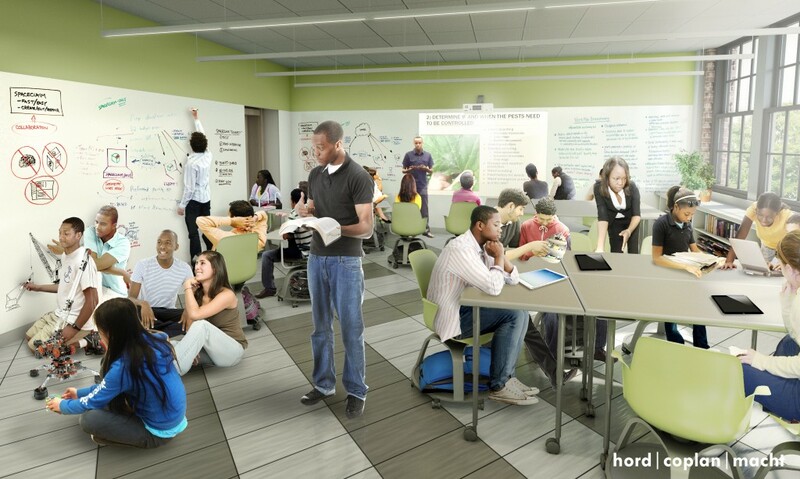 Aside from being large enough to accommodate the school’s growing population (Gwynn Falls was built for 2500 students; GSA is expected to have 800+ when it moves in), the new school is a more central location for the students, 60% of whom will be able to walk there. Additionally, Gwynn Falls sits on more bus routes, which opens up the student population to neighborhoods beyond West Baltimore. The improved accessibility makes it easier for parents to attend events and school programming, including training and certification programs. The idea of a school-as-community-linchpin is as central to Green Street Academy as their embrace of the green movement, and moving to Gwynn Falls is a big step towards that goal. Knowing that a lot of the students’ parents work multiple jobs and are subsequently hard to contact, Green Street wants to make it as easy as possible for them to see the school’s process at work, and get involved with it. Green Street Academy’s process, it should be said, is risky. Theirs is a very specific response to problems they’ve seen in Baltimore: lack of educational opportunities, vanishing community involvement, food deserts, and a sense of top-down inertia that allows these problems to fester. Instead of keeping their mission statement vague and easily malleable, Green Street Academy has built an identity from their ideas about how to engage the community to fix those problems, and they’re standing by it. Before my tour of Green Street’s current location at North Bend Road, I revisited their website, which quotes President Obama’s 2009 economic stimulus bill speech. Obama made a point that Americans are “surrounded by unmet needs and unfinished business – in our schools, in our roads, in the systems we employ to treat the sick, in the energy we use to power our homes,” and he was right. In fact, he could have been speaking about Baltimore specifically. It’s no accident that Green Street Academy is located in West Baltimore, a community long overdue for investment. Examples of this include having students write and design an ecology-themed book, which integrates language arts, science and visual art, as well as ongoing group projects like the school’s chicken coop, koi and tilapia tanks and the greenhouse. The greenhouse is also a way to introduce students to entrepreneurship, in that it’s mostly student-run; the school’s Farm Club does the physical work involved with maintaining it, decides what to grow and when, figures out budgeting, sells produce at farmer’s markets, and maintains relationships with local businesses like Woodberry Kitchen and Classic Catering. That sounds like a lot, but Brian Schumacher, the school’s academic dean, told me that getting students into green initiatives has been easier than expected. “Students are seeing the big picture,” he said, “and they love the projects.” A 14-year veteran in education, Schumacher is excited about Green Street’s potential, and credited the school’s dedicated teaching staff (which has seen minimal turnover thus far) with helping students broaden their worldviews and make valuable connections between content areas. I also spoke with two current Green Street students, Khalil and Antonio, who are two of the sharpest eighth graders I’ve ever met in my life. Both attended Sarah M. Roach Elementary, and both of them chose art as their favorite class. As a semi-professional performing arts weirdo, this warmed my heart. Khalil’s favorite project thus far has been teaching other students about fish; why they change color, how to change their water and maintain pH levels, how to protect their eggs, and so on. Antonio’s favorite projects were the school’s plant wall and chicken coop, and he told me he wants to attend the School for the Arts and become a veterinarian. If he and Khalil are any indication, Green Street Academy students are more than capable of meeting the challenges set before them. In fact, they already have. Green Street’s technology focus includes Microsoft certifications for students, who are training other community members in computer literacy. Dr. Schochor told me that adults trusted students more than their own age group when it came to using technology, and have been very receptive to learning from them. But what about when things don’t work? Even successful people get sent back to the drawing board, and the possibility of failure (itself a loaded word in today’s economy) is one we all face at multiple points in our lives. Green Street’s coursework and educational structure account for that as best they can. Important, but not immediately quantifiable, life skills like perseverance and resilience are emphasized during projects, and students’ coping/communication skills are—along with more standard evaluations like grades—part of the learning data that parents receive. It’s a more thorough and instructive, and gentle, version of the hotly-debated “grit” educational theories proposed by psychologist Tammy Duckworth, which Edutopia summarizes quite well. I took the same route home from Green Street’s North Bend location as I did from their soon-to-be home at Gwynn Falls, and I spent both drives thinking about what Green Street Academy has already accomplished, and how much more they can do with a space that they, and the community surrounding them, can transform to meet their needs. I also thought about how so many Baltimore neighborhoods like the ones I’d just visited are cynically dismissed as hopeless wastelands, forever lost to poverty and crime. The far-too-common observation that those communities can’t and won’t improve (or that they can only improve after heavy gentrification) is grossly unfair to the people living in them, and also wrong. Green Street Academy feels the same way, and their goal of blazing new trails to progress through education is as laudable as it is necessary. As my car rumbled down US-40 to Howard Street and back up to Hampden, I felt worlds away from West Baltimore. That feeling won’t last. It can’t. From the roof of Gwynn Falls Park Junior High, those divisions are already gone.